Charlie Charlie & Other Spooks is a collection of bizarre magick and paranormal entertainment routines subtitled 'Contemporary Bizarre Magick for the Modern Era'. The routines, ideas, and presentations contained within take their inspiration from modern urban myths and legends. There are three main sections to this ebook. 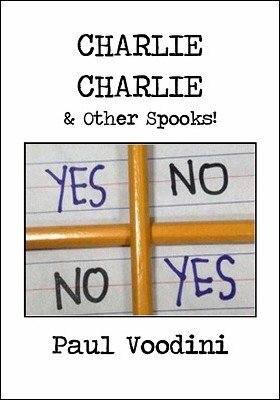 The first section covers the Charlie Charlie spirit communication phenomena that has been sweeping the internet in recent times. Paul Voodini takes the original idea, thoroughly explores it, and offers new insights and presentational angles that enable to performer to take this simple idea and turn it into an integral part of a seance/paranormal show or even a show in its own right. Five presentations for the Charlie Charlie 'game' are detailed within. To present Charlie Charlie you will need nothing more than pencils and paper, although a presentational idea contained within uses a pendulum. The second section covers an urban myth from the 1980s - the 'Crying Boy' painting that was claimed to be cursed and the cause of many tragic house fires. This is a routine that is poignant, emotional, and guaranteed to send a shiver down the backs of your guests! This routine utilizes a haunted key, and works best with the cheap, 'brand new' variety readily available for a small price from all magic retailers. The third section features a modern myth, the Slender Man or Der Grossman. This is a myth that began on the internet but soon took on a life of its own, changing and mutating as it spread from schoolyard to schoolyard, city to city, and nation to nation. The routine contains an important message about the nature of fear, and utilizes a simple thumb tip. 1st edition 2015, 22 pages.